Have you ever seen something online that you wished you could do yourself? Well, the women that make up the Tenfold group certainly did. And they rose to the challenge! Their innovative approach has created some fantastically unique pieces, and we want to share them with you! 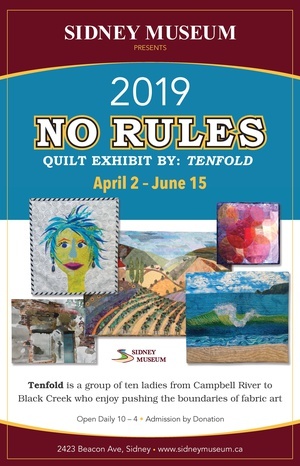 Sidney Museum is hosting the No Rules: Quilt Exhibit April 2 through June 15 featuring a wide range of themes, styles and techniques. "I describe TenFold as a group of ten slightly crazy women from Campbell River and Black Creek. It started about 10 years ago with a couple of women wanting to experiment with innovative ways of manipulating fabric that they had seen on the internet. Gathering a few friends with the same desire we forged forward. We started quite small but over the years have pushed ourselves to try many different things. Sometimes it has been a struggle as we all came from very traditional quilting backgrounds. However, you will see in the selection of pieces that we have created some truly interesting art. We do enjoy challenging each other as well as learning new processes, and have had a number of Tenfold Shows locally with a big turnout. We are now looking forward to sharing our innovative art with a fresh audience in the Victoria area." The Sidney Museum is located at 2423 Beacon Avenue and 4th Street, in the lower level of the Old Post Office, in historic Sidney-by-the Sea, British Columbia. The museum hours of operation are Daily, 10:00 A.M. - 4:00 P.M. Admission is always by donation. For further information about this event, please consult our website at www.sidneymuseum.ca; by telephone at 250-655-6355 or email us at info@sidneymuseum.ca. Check us out on Facebook, Twitter or Instagram @sidneymuseum. The Sidney Museum’s mission is to acquire, preserve and display the heritage and culture of the communities of the Saanich Peninsula.